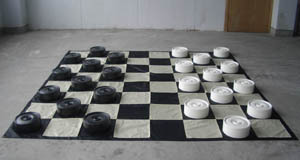 Large Giant Draughts/Checkers set with nylon board. Type: EQUIPMENT. Detail: GARDEN. Product Code: GDC. Large draughts/checkers pieces and nylon board which comes with tent poles so can be secured to the floor. Height of a piece is 9 cm and base diameter is 25cm, made with tough plastic. Ideal for parties, schools and tourists sites. The draughts/checkers set comes in one large box weighing 12.5 kg. Please contact us for a quote on postage as standard charges do not apply. Where possible we will use Australia Post and sometimes courrier company TNT.